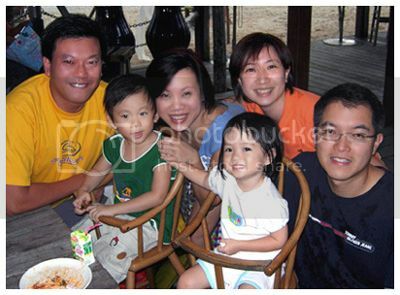 sat@sentosa - A mummy's inane blabberings..
boy played so much till he was completely drenched with his perspiration..
from left :Siti,Sophie,Rachel,Cris,Gwen,Dymphna,Pie Ling & Lynn..
Great bunch of gals. Never had any problems with them & they took their sat off to help me with this event! hopefully this year's bunch will be just as fun! It's really a small world out there..Maureen and I first knew each about 16 years ago where we had worked in a consultancy firm together..and we met again after I joined SPH. When I introduced Maureen's husband , Bun to my hub yesterday, the former was like.."Eh, we know each other! He's my reservist mate!". Hubby was surprised that I knew his wife too! li`nicole has really pretty eyes. When is Aidan gg to hv a li`sister ? haha. but anyway..think close shop liao! 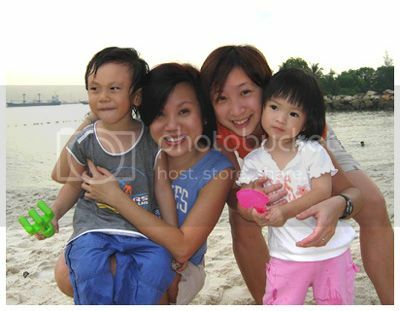 Old liao lah! No energy left too! *squeals* that little girl is soo pretty!!! :D :D :D :D :D she's gonna grow up to be a da mei ren for sure. Totally agree. nicole is really pretty! love her eyes and she has such beautiful creamy white complexion!! one of the local banks used her (when she was a baby) in their below-the-line ads for one of their campaigns..
still dare to hehehe..! my hub still asked me..who told you i was at the pub!!! 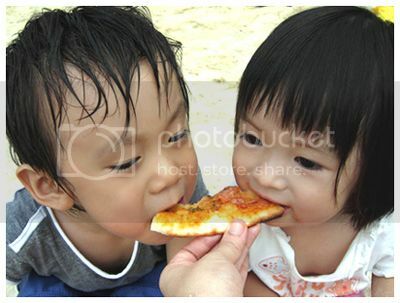 LOL at the first photo of them two eating (pizza?) from opposite ends, it's really cute how nicole looks to be chewing a little itsy bitsy piece, while aidan appears to be chomping on the whole end. TAI CUTE LE!!!! 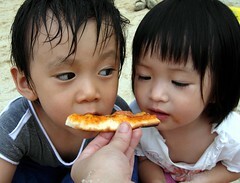 here's another pic of them..see aidan checking her out when he's biting on the pizza. he was probably thinking "dont u dare eat my pizza!!" aidan and nicole make a handsome pair! they are both so adorable and good looking at their age. singapore is so small. everyone seems to be connected to everyone in some way or another. i also do the sms Lj friend thing to check if she's in the vicinity when i saw her hubby. haha! yeah..probably more so in singapore. i remember there was this article colin goh wrote..where an iranian lady he met in NY mentioned a singaporean she knew as a teen and it turned out he knew the person too..
(okay..googled for the article and there's a repro of it here. i love little nicole's eyes. she's a beauty. yeah..very 'mee-ren' type of eyes..and her lashes are dark and long too! don't need mascara! ooo nicole has the loveliest eyes! pretty pretty! chup her for aidan in the future! whahah! you should see her eyelashes..thick and long!! she's gonna be really goodlooking when she grows up. erm..erm..i think this mommy here ain't gonna think that far ahead. aidan can choose his own partner hehe! AWWWWWWW i love nicole! she's so pretty! like aidan they've such nice big eyes! gosh what a lovely match! alamak..nowadays whenever i post a pic of aidan with a girl, pple think im matching him up with her!! but yeah, she's such a darling!! ren jian ren ai! the little girl is sooooo pretty! delish??! hah..he was so sticky n gross! wah! 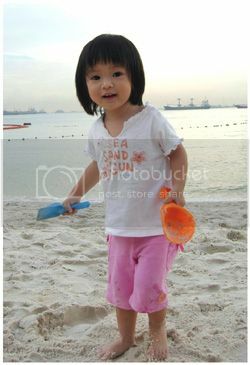 little nicole zhen de hen mei lor! I thought Aidan went into the sea/pool or smth.. he really looked WET! Didn't know he could sweat so much! Heh. i perspire a lot too so he probably takes after me..
Nicole is slightly over 2 years old..!